If you want to keep your baby close to you while you sleep in the same room but you live in a space-limited home, a bassinet may be a good idea for you. It is actually a very good solution for mothers who are breastfeeding so they can put the bassinet right next to the bed or just to keep the baby close to themselves in order to control the baby while he/she is sleeping in the same room and in this way avoid the risk of SIDS, which is much higher in the first month of the newborns. There are a lot of different types of bassinets offered at the market but we decided to review the Graco Dream Suite Bassinet because it is a multi-purpose unit that performs functions for three pieces of equipment. This Graco product serves primarily as a bassinet that offers relaxing and cozy sleeping area for the newborn that with one flip can be turned into a changing table for the baby. Under the bassinet, the unit contains a basket for storage where you can keep all the necessities for the baby. The comfort and safety is increased by the mesh side walls of the bassinets and the lockable wheels of the bassinet that make the transport of the bassinet very easy. Additional features of this versatile product are the vibration settings for baby soothing, mattress cover, soft toys for the entertainment of the baby who is not asleep and a canopy that offers shed from light so the baby can relax and take a nap during the day. All in all, this product can meet many different needs of the family especially in the first 2-3 months of the newborn. Graco is a well-known company on the market of child equipment that designs creative and extremely functional gear for children. One of the safety features of this Graco Dream Suite Bassinet Mason is the lockable wheels. Compared to other similar products where you have to make sure whether the wheels are locked on the piece of the baby equipment when not in use, the wheels of this bassinet are lockable so this prevents accidental sliding or it does not provide opportunity for older children who sometimes wanting to play with their siblings decide to "take advantages" of the wheels and "take their brother or sister on a ride" around the room. The product is approved by the Juvenile Products Manufacturers Association, which has proven to be a company that sets higher standards than the minimum requirements regarding safety. 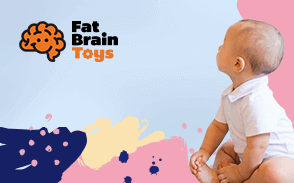 Their stamp on a product, certifying that the product has met safety standards is more than welcome to look for when you are deciding on buying baby products or equipment. On both sides of the bassinet there are mesh panels which are practical since they increase the air flow within the inner area of the bassinet so we can be sure that if the baby turns with the face forward against the side panels he/she will get enough air for breathing. This product is intended for sleeping which by default understands comfort, which in this context means creating cozy atmosphere for sleeping of your baby. The comfort is featured by two vibration settings that use batteries (that you have to provide additionally) and act as rocking that makes the baby falls asleep nicely and comfortably. The canopy is an extra feature that helps the light to be prevented from coming in the bassinet so the baby can rest in a secure and cozy environment. When the baby is awake he/she can be entertained by the soft dangling toys at least for the first few minutes after the baby is awaken. The comfort is enhanced even more with the materials especially a credit can be given to the mesh sides of the bassinet walls which contribute to the breathability of the materials and the greater air flow. The bassinet has a closed system regarding the walls that ensures that it will be more difficult for the babies to get their legs or arms stuck compared to the more loose or open walls of bassinets. The Graco Dream Suite Bassinet is a versatile product. It consists of a bassinet that at the same time can be used as a changing table for the baby and a storage bin that is placed at the bottom of the bassinet. The Dream Suite Bassinet is a lightweight product of 18 pounds and with its proper size it can be easily fit next to your bed even in a small bedroom. The wheels are a convenient feature in case you would like to move the bassinet to another room or place in your home and makes the transport of the bassinet easy. The mattress in the bassinet comes in dimensions that make it perfect for longer use even up to 6 months old babies. The mattress comes with machine washable mattress cover which is extremely useful especially when talking about newborns. One of the features that is mostly likeable about the Graco Dream Suite Bassinet is that not only it can be used as a bassinet but it can be transformed into a “bedside care center”. The bassinet has a push-up button that at one click can “switch” the function from sleeping into the bassinet to changing the nappies on the changing table. The flip from bassinet into changing table is very convenient feature for newborns especially if you keep the suite bassinet very close to your bed and your baby needs changes of diapers very often during night sleeps. The change from bassinet into changing table does not take too much effort and you can do it alone with one hand while you are holding your baby in the other. Unfortunately, these ease of switch is not applicable the other way around, meaning that if you want to reverse back from changing table into bassinet you need to use both of your hands and it takes more effort. This Suite Bassinet can also be used as a place for storage because there is a spacious basket under the bassinet or at the bottom of the unit. This is very handy since you can keep all things that you need for diaper changing and so much more that you might need for the baby. One of the disadvantages of the storage basket is that it is pretty bulky and cannot be disassembled entire or quickly like at some other similar products. The bassinet is recommended for sleeping of babies who are not heavier than 15 pounds, while the changing table can be used for babies up to 30 pounds. Compared to other similar products the Graco Dream Suite Bassinet has a larger area for sleeping which makes it usable for up to six-month babies the most. The feature of longevity is extended due to the versatility of this product or the multi functions that this product has. Once the baby is grown you can still continue to use this product as a changing table for your baby and since babies need to be changed many times per day it is more than certain that you are going to use this function of the product. 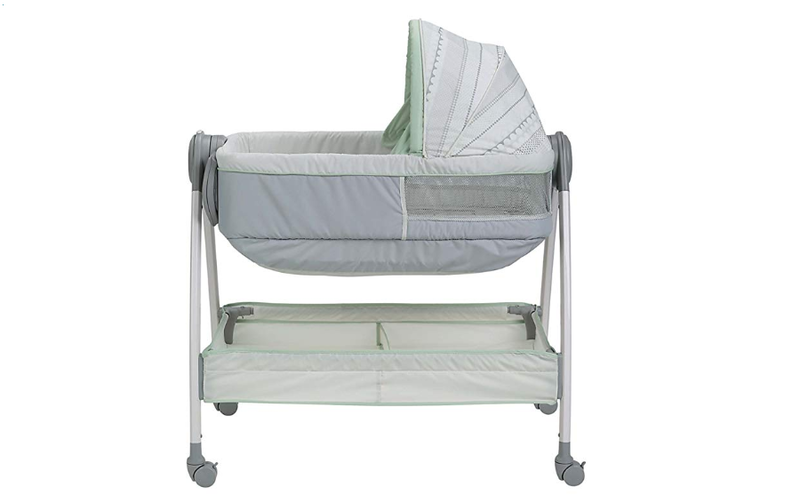 This Baby Suite Bassinet is in Mason fashion which is characterized with neutral shades of green, gray and brown. This contributes to the stylish design of the bassinet and the neutral colors are really relaxing for the baby. Because of the simple and stylish design with neutral colors this product can fit in any décor at your home. The Graco Dream Suite Bassinet is additionally complemented with features such as canopy that acts as blockage of the light when your baby wants to take a nap during the day but the light is on the way. Additionally you can use the vibration setting that has two speeds if the baby needs soothing, which also adds to the comfort of the baby. This cozy cabinet also can serve as entertainment place for a baby who is resting in the bassinet. There are two soft toys at the top of the bassinet that keep the attention of the baby for a while. This complete care center can also be maneuvered from one room to another with the help of the four lockable wheels. The size of the bassinet is appropriate for a newborn. The assembly of the bassinet is pretty easy and can be set by anyone in less than half an hour. There is no need of special tools for assembling. The product weighs around 18 pounds but it is quite firm. It has a strong and solid construction with metal legs. Although majority of the customers agree that the product is sturdy still a number of them claim that the bassinet can be a little wobbly especially if the baby is heavier or moves a lot in the bassinet or you put heavier things in the storage basket of the unit. The four wheels that can be locked also add to stability. The mattress in the bassinet comes with a mattress cover that can be removed easily and it is a machine washable. The bottom of the changing table is made of Velcro-ed which is easy to clean material which is very convenient taking into consideration the function of the changing table –changing nappies and the babies being unpredictable, so if something happens you can just wipe it out. The fabric of the bassinet can be cleaned with a damp cloth. The only drawback is that edges of the bassinet are made of fabric which makes it harder for cleaning. The price for such a multi-purpose product for your newborn is more than reasonable taking into account all functions and features of this suite bassinet. For a single price you get three products: a bassinet, a changing table and storage basket. The material at the changing table can be wipe-cleaned. You can continue using this suite bassinet even after the baby has grown up and does not sleep any longer in the bassinet so it adds to the longevity of the product. It is a cute bassinet which is gender neutral and this is why you can use it for more than one child even if the kids are from different gender. The Graco Dream Suite Bassinet is a three in one product. Its primary function is to provide a comfortable place for sleeping of babies who are under 15 pounds. The product can be positioned right next to the parents’ bed so you can check your baby at all times without having to get up from the bed. 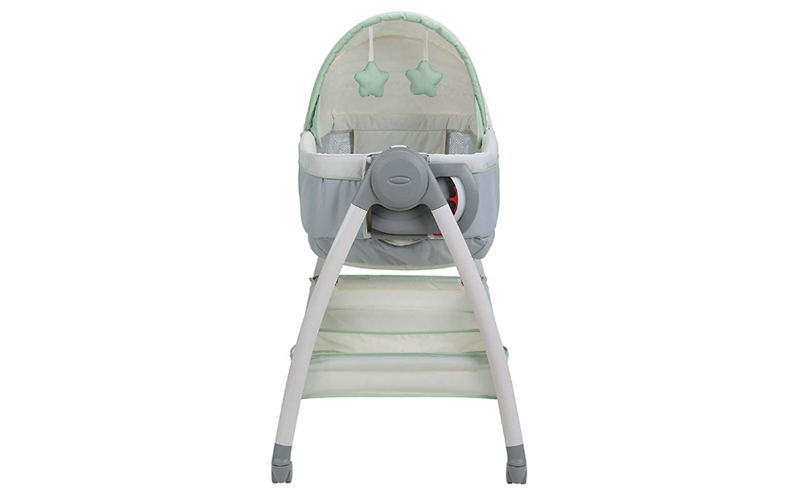 If the baby cries during the night or in sleep the two-speed vibration settings can be used for soothing the crying baby or when the baby is awake he/she can be entertained in this bassinet by the soft dangling toys. The sleeping function of this bassinet can be transformed at a click of a button into a changing table where you can change the diapers of a baby who weighs up to 30 pounds. Everything you need in order to change the baby can be put in the storage basket under the bassinet which is very handy. If you want to move the bassinet from one room to another you can easily do this because there are wheels on the suite bassinets that are lockable for added safety. 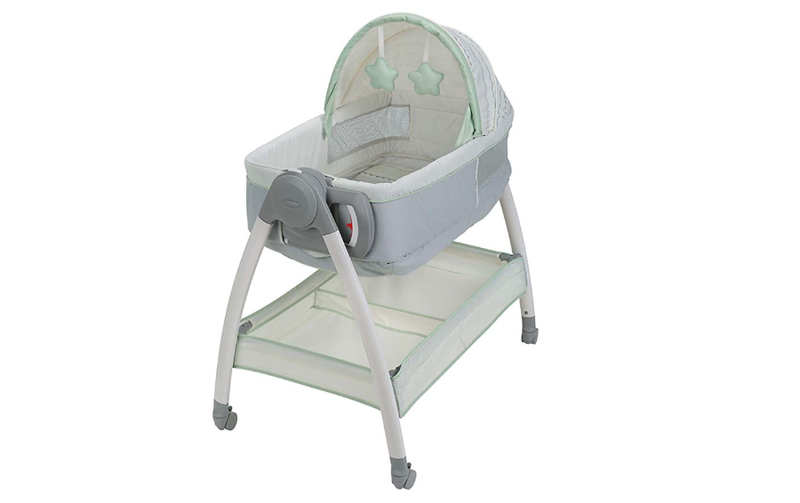 The materials of the bassinet are breathable and safe for the baby. In conclusion we can say that the Graco Dream Suite Bassinet –Mason is a multi-purpose product that can be used in the first months of a newborn.